These round tortoise sunnies are only $10.99! Super cute on and a near perfect designer dupe. And these wedges are the shoes you'll wear all summer! They come in a few other colors and they're the perfect heel height that still keeps them comfortable for long periods of time. 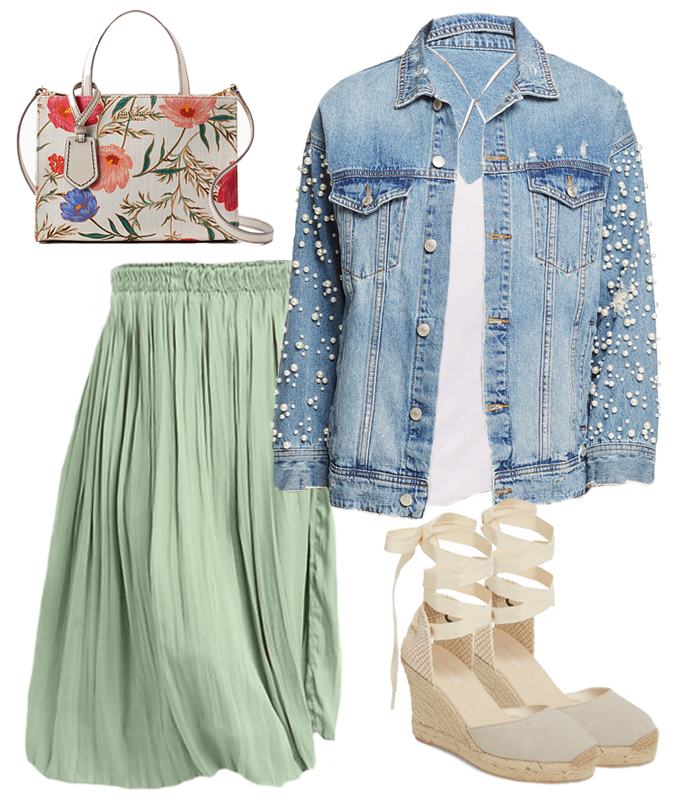 This springy look would be the perfect Easter Sunday outfit! What's better than a lace dress in the spring? You'll wear this on repeat! It comes in three other colors (it'd also be the perfect spring wedding-guest dress!) and the 3/4 sleeves is perfect if it's still chilly where you live. When you find a super flattering (for all bodies!) maxi dress that's as pretty as this one for $55 (!!) you buy it in the blink of an eye! ;) It's so versatile and would be just as cute in the summer with a denim jacket. If you like to keep it a little more casual (but still springy! ;) this is the best way to go in my opinion! I LOVE that denim skirts are back - I used to live in them when I was little! This white wash denim skirt is the perfect length, and it's perfect paired with a cropped, knotted top (only $23!) like this pretty coral one. We all love the classic Tory Burch Miller collection, and this year there's a fun twist on the classic pair of sandals - these gold Millers have an espadrille bottom making them a little more "beachy" casual! I LOVE them! And you can't go wrong with a circle, straw bag this season - the woven bag shown above is $59, but I found a PERFECT $29 dupe here!! Major PSA - this gold Kate Spade watch is 40% off - making it only $111! And this pinstripe wrap dress (that also has bell sleeves - what more could you want?!) is under $50. It's the cutest, and I always say if you don't know what style dress to try, go for a wrap dress! Always a winner! Most years I get dressed up for church on Easter Sunday and then like to get just a liiittle more comfortable for spending time with family! This is one of my favorite spring looks and not just for Easter - I'm all about pink this season (what else is new?)! This front-knot long sleeve tee is great for transitioning to spring and we need to give a major moment to these ombre pink bow block heels! They are just the cutest ever - they're a block heel so they're comfortable and I don't know anyone who can pass up a cute bow! If you have a wider foot, go up a half size! I feel like I say that every one of these is my favorite, but this really may be my favorite Easter look! I'd tuck the cami into the skirt and bunch it up a bit, and roll the sleeves once or twice on this adorable denim jacket. These colors for spring make me so happy, ha! Obsessed with that yellow wrap dress and the denim jacket/green skirt outfit! I like that you included some more casual Easter looks! Not everyone goes to a religious ceremony on Easter, but almost everybody likes brunch! Such cute, springy looks! Especially loving the more casual one with the white denim skirt. Those first shoes are SO precious! I also love the yellow wrap dress! I love these ideas! My favorite is the pink dress! So cute! I am SO obsessed with all of these outfits!! The blush lace dress is very similar to the one that I will be wearing on Easter! 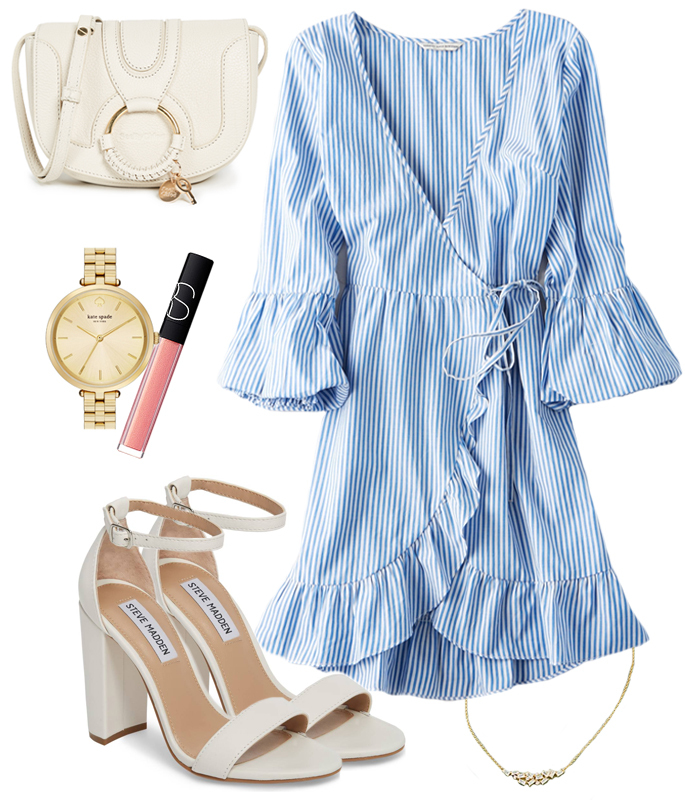 I need that blue & white pinstripe dress! I am still debating on what I will be wearing Easter Sunday. I have several dresses picked out that I have purchased over time but haven't worn. It may depend on the weather. I love several of the outfits that you put together. Already looking now. OKAY those pink bow J Crew shoes seriously are some of the cutest things I have ever seen! Need to get myself a pair, they are so dainty cute and girly LOVE LOVE THEM! Ohhh love your picks! I haven't decided yet, but these outfits have inspired me. In LOVE with all the pieces you've chosen! Loving them all but my favorite is the yellow wrap dress! I LOOOOVVE that yellow dress so much! 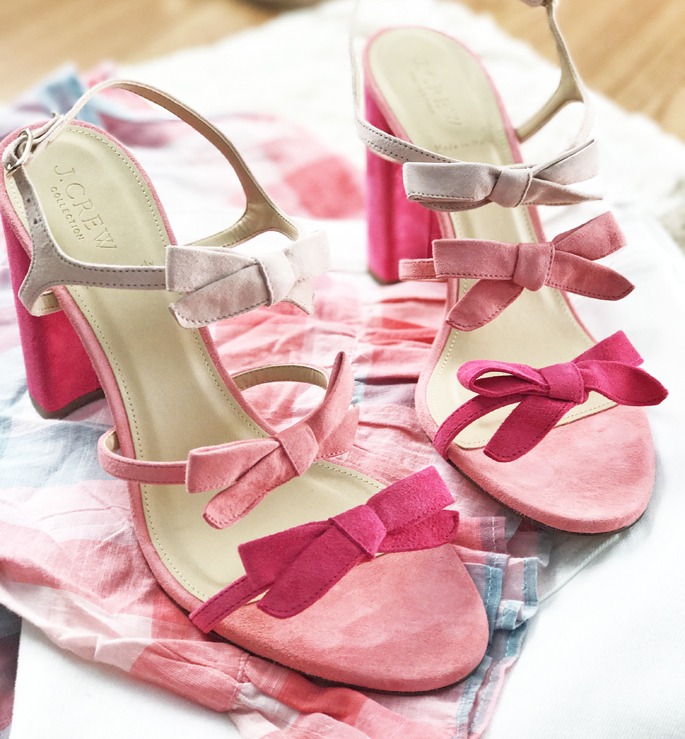 Okay so obsessed with these pink ombre bow heels! SO, so cute and perfect for Spring! Ok I opened this and GASPED at those bow heels...those are 100% Coming Home to mama. Like OMG. I am obsessing over all of these easter outfits! SO SO cute. I am espeically loving the yellow wrap dress. Thanks for sharing all of these cute looks. The first and third outfits are my favorite! These outfits are so cute! My favorite is totally the yellow dress! i won't even just wear these for easter, i would wear it for the summer time too xD these are so cute! I love all of these! I think you just picked out my entire spring wardrobe not just Easter!! Thank you!! I love that pink dress with the purple heels! It would be so perfect for Easter! Love these! The yellow dress is awesome! I love that floral maxi dress! So cute! All of these are SO cute! I am loving that floral maxi dress, it's so pretty! I'm in love with these picks, specially all the pastels! Oh and definitely need that pearl embellished denim jacket asap! Love these outfit ideas for spring!! Really inspiring!! These are all excellent outfit ideas - and not just for Easter, but for all of spring and into summer! I especially adore that killer yellow dress! I adore everything you posted. Seriously! LOVE your style. That yellow wrap dress and the green skirt. Soooooo cute! Those TB espradille sandals are too cute!